Handles are adjustable and rotate back to allow a wide range of comfortable and secure positions. Closed cell foam armrests provide a comfortable, sure grip. 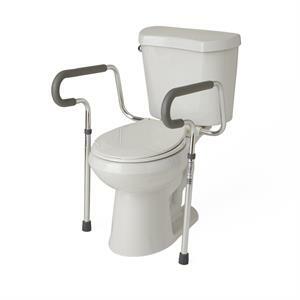 Adjustable height 26" to 31" accommodates standard or elevated toilet seats. Easy-to-clean aluminum frame mounts securely onto bowl with adjustable bracket 18" to 24". Height adjustment armrest to floor is 26" - 31". Width adjustment between armrests is 8" - 24". Overall Depth: arm 16.75"; at leg 12".